"You're in dire need of an upgrade." Tony Stark (Robert Downey Jr.) will play a big role in Spider-Man: Homecoming and, as a result, his influence will be everywhere. That's none more obvious than in Spider-Man's suit, which is full of advanced technology, from web wings to a detachable drone. At the end of Captain America: Civil War (Spidey's MCU debut), we find out that the suit allows Spider-Man to access a holographic display, which likely acts as an inventory wheel you'd see in a video game. For example, we've seen that the gauntlets let him see a fly-over view of New York City, which he could then use to navigate the city's streets. That is but the tip of the iceberg of what the suit includes—there's probably much more that we haven't seen, too. 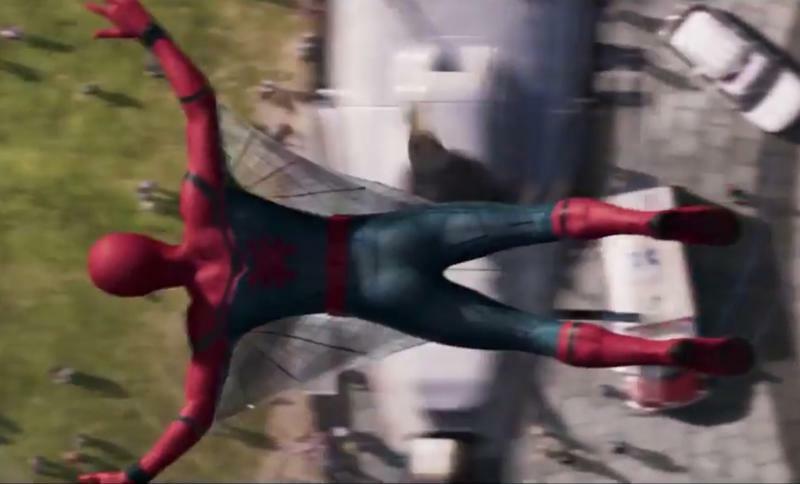 In one of the trailers, we find out Stark has activated a "Training Wheels" protocol, which prevents Spidey from utilizing the suit to its full potential. When that protocol is off? Who knows what goodies we'll see. We've seen numerous iterations of Spider-Man on the big screen, but none have featured so much tech. Of course, you can't have Tony Stark involved without some cool toys, so it makes sense the filmmakers are tapping into Spidey's comic past for inspiration. Ever wonder how Spider-Man's suit fits so perfectly? No, he doesn't have a world-class tailor; instead, his suit features a cool vacuum-fitting function that makes it incredibly easy for Spidey to slip in and out of at a moment's notice. A handy feature, no doubt, when you need to spring into action on a whim. Remember the tag scene in Captain America: Civil War? While messing around with the suit's gauntlets, a holographic display allows Spider-Man to access the many different functions built into the suit. And, in an homage to the comics, the holograph appears to display the Spider-Man signal. You can't have an advanced suit without an advanced AI. In the latest trailer, the F.R.I.D.A.Y.-like AI is capable of providing Spidey with helpful advice, such as directions. It's a cool addition, and makes the superhero more Iron Man-like than ever before. Speaking of the suit's AI, she is able to deploy features—in this case, a parachute—to assist Spider-Man in tough situations. No doubt, him and the AI will have a lot of great back-and-forth, just like Stark and JARVIS often did. What other features will she deploy to save Spider-Man's skin? He can't fly, but he can glide, almost like an arachnid flying squirrel. (Wow, that image is terrifying.) The web wings have been repeatedly shown off in the trailers, suggesting they'll play an important role in a key battle. And, come on, they look cool, adding a different dynamic to how Spidey traverses the world. It's a bird. It's a plane. It's Spider-Man's drone. That's right, the Spidey emblem also doubles as a drone, which will likely help him track baddies and keep tabs on what's happening around New York City. According to the most recent trailer, Spidey's suit features a possible 576 web shooter combinations. That's pretty consistent with what we've seen in the comics, but a marked change from what has been shown in the movies. It'll allow Spider-Man to get a little more creative when he takes on bad guys. This is all of the tech that's been shown off so far; I'm sure much more will be shown off in the movie, especially if Spidey figures out how to bypass Tony's "Training Wheels" protocol. As we've seen, however, Tony eventually takes the suit back, which Spider-Man says he's nothing without. Do I smell an opportunity for the character to grow? I do indeed. It's cool that Marvel Studios and Sony are really tapping into Spider-Man's past and using gadgets and gizmos that we've only seen in comic books.